Oftentimes, on the search for a good place to eat, we resort to searching through apps like Yelp to find restaurants near us that we may like. Based on reviews, cuisine, and other factors, we select the place that we want to eat at. We decided to make this app to simplify this process while allowing the user to identify potential eating spots while moving safely. Currently, the app displays a graphic containing information (name, reviews, closing time, description, etc.) when the user gazes at and selects a restaurant in the vicinity. In the final version, you would be able to use mixed reality to see/scroll through more virtual graphics of information like menus, actual user reviews, etc. In regards to ideal functionality, our app would access the Google Maps API and its algorithm for identifying restaurants. Google Maps identifies restaurants with a small blue circle with a fork and a knife inside. By accessing such information, we'd be able to make our own markers for restaurants based on what Google refers to as restaurants, and we would extract useful information to display on the graphic like user ratings, closing times, menu, etc. For example, the user reviews would come from the Google Businesses API. Because OAuthorization for accessing Google API's takes around 2 weeks, we resorted to the basic functionality that we currently support- AR graphics depicting currently known info (the star rating based on current Google ratings). 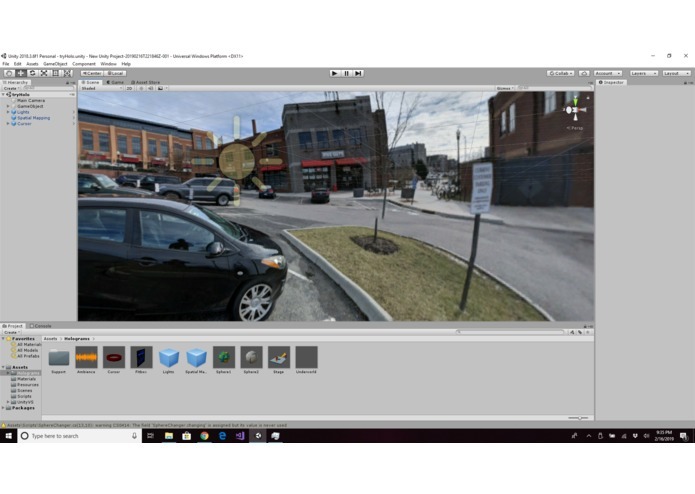 We built it using Unity, Visual Studios, and the Microsoft Hololens API. First, we created the visual graphics using unity and tested them in the Visual Studio's Hololens simulator. To ensure proper functionality within the Hololens, we implemented the Hololens API. After hours of trouble and frustration with running the emulator software, we finally figured out how to run it properly. This took up a bulk of our time and discussion, as we couldn't really move forward without finding a viable way to simulate our Unity MR app. The simulation working after a great deal of effort and time was probably the biggest accomplishment of the project, as it lead to much more development of software and ideas. Working with a team of people from different aspects of the world as well as different skill levels. Improving the app and maximizing its functionality is really a matter of attaining access to Google's API's for Maps and Businesses. Adding more graphical options like emojis to depict user satisfaction could be helpful. In addition, preset filters through the apps could limit what restaurants the users see. For example, a user who only wants to eat at 4 star-rated restaurants and above would only see 4 and 5-star rated restaurants through their app. There are many exciting ways to build off of this app and maybe apply it to other niches, such as shopping.